This is my custom batch exporter, inspired by Jos Balcaen's Batch Export/Import, I needed some extra features so I created my own. Perfect for exporting a lot of objects quickly. - Added the "export as a single object" feature. - Added a bunch of formats. - Added a "Help" button that opens the documentation. - The script now runs faster. • Select all the objects you want to export, then click on "Export selection"
• Or if you need to export your selection as a single object, click "Export selection as a single object"
• All options are saved. This means all the changes you make in the checkboxes, text fields and the drop down list are remembered when reopening the script. Moreover, Those changes are saved in the current scene, so you have to save the scene after tweaking the options to save them. 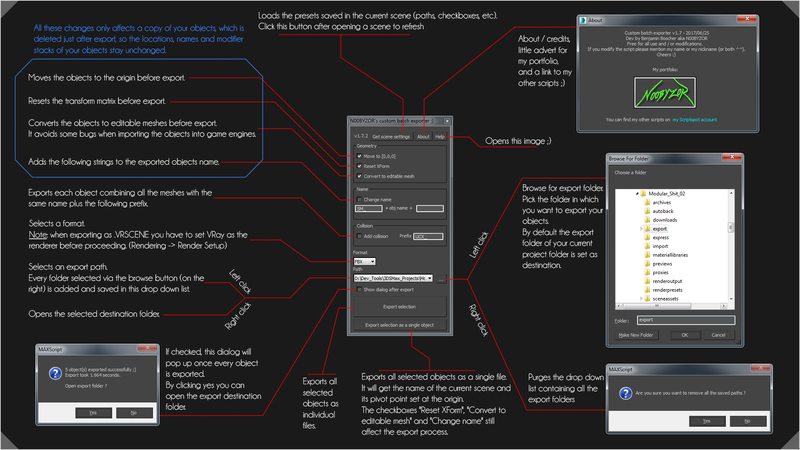 That way each of the scenes you are working on has its corresponding options and export paths. •When exporting objects with collision, do not select the collision meshes, only the objects. Also you don't need to place the collision meshes at the same location as the objects, the script will do it for you and replace them at their original location after export. Only tested on 3DSMax 2015 & 2016. 2015 - 2016, but it should work on other versions. Submitted by dub73 on Mon, 2019-01-14 02:27.
would be nice to export groups as well? or does it work? Submitted by asymptote on Tue, 2017-08-01 15:15. Sorry just seen this, I had my alerts turned off, I'll check it out tomorrow. Submitted by N00BYZOR on Mon, 2017-06-26 11:28. Submitted by asymptote on Sun, 2017-06-18 03:46. I export for game design so have a need for exporting the entire selection as a single FBX. I like these FBX exporters but they all export the selection as individual files, is there no way to set the name for the scene and have it save the selection as a single FBX?